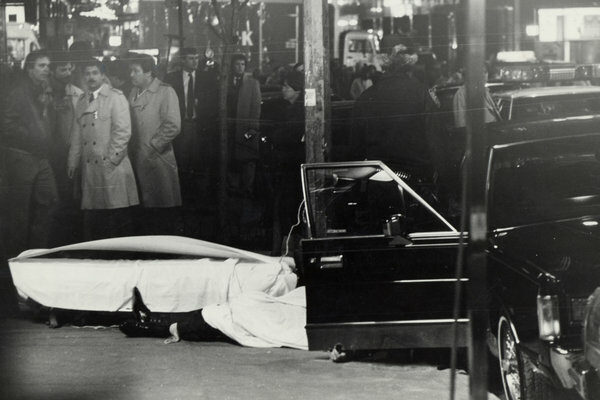 Believed to have been set up by John Gotti, a mob boss, Paul Castellano, was killed outside Sparks Steakhouse in 1985. The New York office of the F.B.I. confronts an array of challenges — from cyber and financial crime to global terrorism — that would have been unimaginable half a century ago when it first squared off in earnest against the mob. And so, in recent years, more and more agents have been assigned to those modern threats and fewer to the L.C.N., the bureau’s shorthand for La Cosa Nostra. Now, for the third time in five years, the office is reducing the number of agents assigned to traditional organized crime cases, bringing the total remaining to roughly three dozen, people with knowledge of the changes said. Those agents are responsible for investigating some 700 so-called made members and 7,000 associates. The number of squads focused exclusively on the city’s five crime families will be reduced to two from three. The cuts will leave about 60 percent fewer agents in New York City investigating the mob than in 2008, when there was — as there had been for decades — a separate squad of 10 to 20 agents devoted to each crime family. The changes come after two decades of success in the fight against the mob, and they have met with mixed reviews within the Federal Bureau of Investigation and at some of the other agencies that, over the years, worked to wrest the mob’s grip from some industries and loosen it over others. Some see the changes as a necessary evolution, a reaction to the changing nature of crime and threats to the nation in a time of tight budgets. Others fear the reductions could allow the city’s five weakened crime families — the Gambinos, the Bonannos, the Colombos, the Genoveses and the Luccheses — to grow stronger, regroup and reassert themselves. Other F.B.I. offices in cities where traditional organized crime families have long exerted influence have seen similar cutbacks. Ten years ago in the Chicago office, for example, two squads with 12 agents each were devoted exclusively to investigating La Cosa Nostra. Now only one squad with 12 agents focuses on the mob, a person briefed on those changes said. Prof. James B. Jacobs, the director of the Center for Research in Crime and Justice at New York University School of Law who has written extensively about organized crime, construction and labor unions, said the reductions presented a potential problem, but that a re-examination of the bureau’s priorities was long overdue. “We just don’t have enough resources,” Mr. Jacobs said, adding that James B. Comey’s nomination to succeed Robert S. Mueller III as F.B.I. director could present an opportunity for just such a review. He also said that state and local governments should play a greater role in investigating organized crime cases. The hallmark of organized crime has long been the ability of its more imaginative members to find creative ways to penetrate, corrupt and control industries, and thus separate the government, businesses and citizens from their money. Coupled with the omnipresent threat of violence and more mundane schemes, it remains an enduring presence in certain sectors of the economy and certain neighborhoods around the city. Over the years, the mob has found its way into more and more sophisticated schemes, feeding on everything from the stock market to the Internet and the health care and telecommunications industries, all while remaining entrenched in construction and staples like gambling, loan-sharking and extortion. A resurgent mob, officials fear, could drive up the costs of a range of goods and services in the city, including private carting, construction, health insurance and restaurant linens. “The problem hasn’t gone away,” said one senior F.B.I. investigator, who like others interviewed for this article, spoke on the condition of anonymity because they did not want to publicly criticize their superiors. “Just because you put a guy away,” he said, “they replace him. They make new guys. Unless you stay on top of it, you won’t know who those guys are.” And if you don’t know who they are, he said, you can’t keep up with what they are doing. The investigator, along with several other current and former officials, cautioned that the reduced number of agents assigned to handle organized crime cases would not only limit the nature and number of cases that the bureau can pursue, but also slow the flow of the informers — the key to most investigations — to a trickle. Informers also serve an important role in helping investigators track developments in mob families: the makeup of the hierarchy, promotions, the induction of new members and their daily activities. Under the old model, there was one F.B.I. squad responsible for investigating and gathering intelligence on each of the city’s five mafia families. At any given time, a squad might be investigating several larger and smaller cases against crime figures. With the cutbacks, one squad, known by the internal designation C5, which previously had handled the Genovese family, will also be responsible for the Bonannos and the Colombos. Another squad, C16, which had long investigated the Gambino family, is now also responsible for the Luccheses.